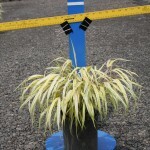 A perennial grass with arching, golden blades that are striped with green. It is best in partial shade, where it forms a compact mound. Spreads slowly by rhizomes. A good choice to brighten up a shady area near trees. Prefers partial shade and moist soil. The variegation becomes more pronounced in part shade.